Census Bureau: Median Incomes Rose And Poverty Levels Fell In 2016 : The Two-Way The number of people covered by health insurance also ticked up. The bureau says the income growth is driven by more people finding jobs rather than increases in salaries. 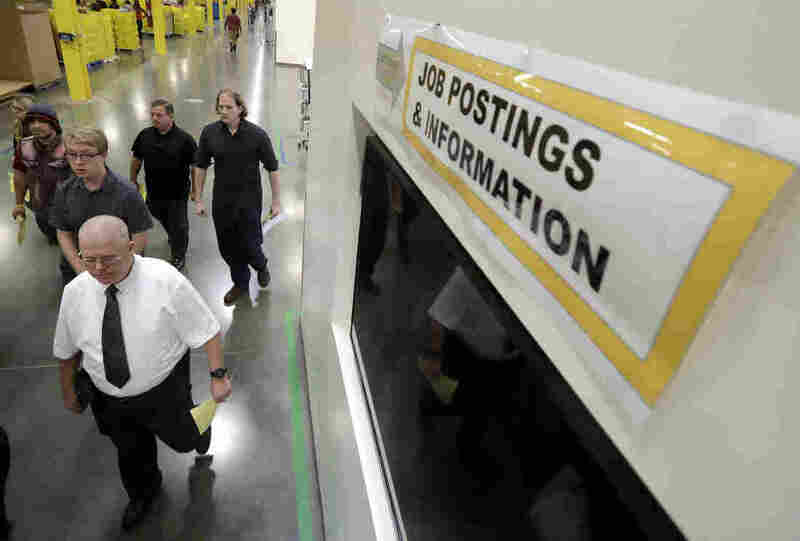 Job candidates take a tour of the Amazon fulfillment center in Robbinsville, N.J., during a job fair last month. The Census Bureau says increased employment is what's driving higher income numbers. There's good news on three primary U.S. economic benchmarks: the poverty rate, income level and number of people covered by health insurance. New figures released by the Census Bureau Tuesday show median household income in 2016 was $59,039 — more than 3 percent higher than in 2015. And because last year also saw income growth, "these are two consecutive years of strong income gains," the Census Bureau's Trudi Renwick told reporters. In fact, "that's the highest median income ever recorded, but the Census Bureau cautions that a big change in its survey in 2014 makes historic comparisons very difficult," NPR's John Ydstie reports. "We're essentially back to about the same levels as 2007, just before the Great Recession." "What it did say was that increased employment is what's driving these numbers. As more Americans find jobs, or move to full-time work from part-time work, households see their incomes rise." Salary increases aren't driving the increase, Renwick emphasizes: "Median earnings for full-time year-round workers was flat relative to last year." The poverty rate is back to pre-recession levels. The Census Bureau says that last year, 12.7 percent of the nation lived in poverty — a 0.8 decrease from the previous year. That means 2.5 million people are no longer in poverty. A different poverty metric, called the supplemental poverty measure, takes into account government programs like refundable tax credits, school lunches, SNAP and housing assistance. That poverty measure also decreased 0.6 percentage points, to 13.9 percent. As John reports, the data show that these programs "do lift millions out of poverty." The number of people covered by health insurance for at least part of the year also climbed 0.3 percent, to 91.2 percent nationwide. John adds that "with the future of the Affordable Care Act unresolved there's lots of uncertainty about where those numbers will be in the future." "The income increases were broadly based across the income ladder and among different ethnic groups, though the gains were less strong at the bottom than at the top," he says. "Of course, there continue to be big discrepancies in the level of income, and a measure of income inequality in the data did not improve." Median earnings between men and women did not change in a statistically significant way. But the female-to-male earnings ratio grew slightly more equal — and this is the first time the measure "has experienced an annual increase since 2007," according to the Census Bureau. Women earned 80.5 cents per dollar that men made in 2016, compared with 79.6 cents the previous year. A previous version of this story incorrectly referred to the Census Bureau as the Census Board.